Artist Krisana Napulphol holds a sculpture of former Thai Navy SEAL Saman Kunan at his studio in Nakhon Pathom. 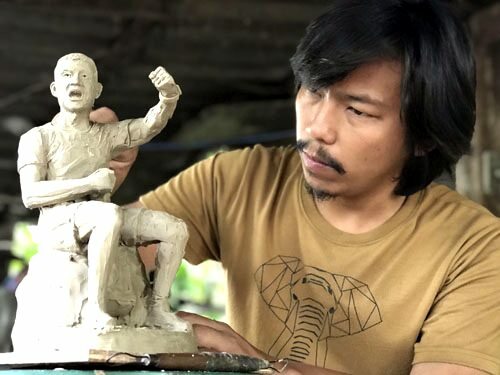 An independent Nakhon Pathom artist has sculpted a likeness of former Thai Navy SEAL Saman Kunan to be auctioned off on behalf of his family after he lost his life during the recent operation to save the Moo Pa Academy youth football team stranded in Tham Luang Cave in Chiang Rai province. The clay sculpture was made by Krisana Napulphol and was named “My Hero” in honor of the sacrifice of Saman Kunan. The artist explained that he had known the former Thai Navy Seal from cycling events and that he was shocked to hear of his death. The sculpture is based on a photograph of Saman that Krisana found while mourning the passing of the rescuer raising a fist in triumph following the discovery of the 13 members of the youth football team. Krisana said he was inspired by Saman’s eyes and demeanor in the photo. The artist has also sculpted likenesses of the commander of the rescue operation, chairperson of the Thai Water Well Association and of Thai Navy Seals. He is to assemble the sculptures for display at his personal gallery as well as auction several pieces so that he may forward proceeds to Saman Kunan’s family.